Toni Jannotta is a dancer, actress, songwriter, vocalist and she has performed in children’s theater, sang in musical theater, and in jazz clubs, including releasing three jazz albums . Her latest project finds her composing music and an original story rhyme for her first book and CD companion project entitled, My Little Heart, Ruthie. The hard cover book is beautifully illustrated by Jennifer Mones with all music and words composed by Jannotta. The companion CD contains eleven tracks, two are instrumental and the rest are Jannotta reading the story as a narrative over music. The story is about Ruthie, a wounded heart living alone in a cold, icy cell with only her harp for company. Ruthie is inspired one day by a warm breeze and she gathers her courage to try and break free of her confinement of self-doubt. The breeze turns out to be a fellow heart named Clyde warming up on his trumpet. Their conversation, told both musically and in rhyme, leads Ruthie to realize that she has the right to be free. Told as a children’s rhyme, this story speaks to the child inside us, a story that allows us to believe we can heal and/or change confining beliefs and be free. The music is relaxing and follows the stories emotions and colors perfectly. Jannotta’s narration is entertaining and heartfelt. Her years in the theater obviously come through in her delivery and her ability to connect to the story and convincingly convey the characters emotions is remarkable. 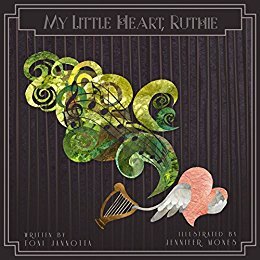 My Little Heart, Ruthie is an enjoyable book and CD, inspired with jazz harmony and instrumentation to compliment both the writing and the illuminated illustrations. The author exemplifies an enlightened approach towards the challenges of healing the past. The music is delightfully whimsical and successfully works together with the Jannotta’s narration. Something different for the child in all of us.